“I like Batman, but Batman was already taken so I’m doing Joker,” said Tyler Shuster, who works to finish up his rendition of the Joker from DC Comics. In Shuster’s artwork, he is trying to get the reflection in the lens just right of the camera that the Joker is holding up to one of his eyes. 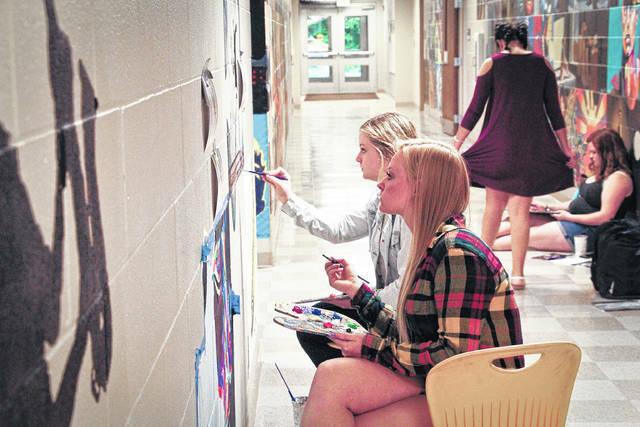 Alexis Poulton, front, and Zoey Babcock, back, work on their pieces of the puzzle that is slowly beginning to cover the hallway walls of Buckeye Valley High School. Students in the studio 2 and 3 art class have six weeks to create their legacy work of art. Drawing on the walls has always been a no-no. Right? 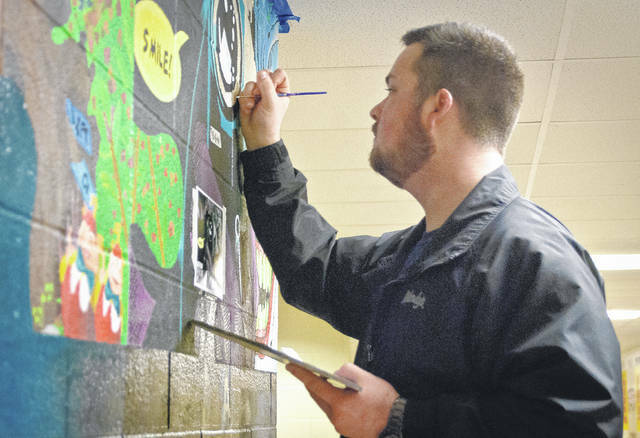 The art students of Buckeye Valley High School are encouraged to draw on the walls and have been doing it for sometime — under a teacher’s supervision, of course. “It’s a way to leave your mark,” said Elijah Mitchell, a senior in TJ Chaney’s studio 2 and 3 art class. Chaney said when he started teaching at Buckeye Valley in 2000, he wanted to create some kind of legacy piece for his students. He went to the principal, who happens to be a former art teacher, and asked about painting on the walls. Chaney said students have to be seniors in the studio 2 and 3 class, a portfolio-building class. The hallway to Chaney’s classroom is lined with his students’ art. Each piece is interlocked into the pieces around it like a puzzle. Each piece is unique, much like its artist. Some of the work is representative of the old masters, while other pieces are modern or even in line with the superhero graphic novels. Chaney said when former students go to a basketball game or visit, they look at their piece. He said sometimes younger brothers and sisters attending Buckeye Valley High School will point out the pieces to their friends. Chaney said many of his students leave Buckeye Valley to go to art school and become professional artists. Chaney keeps track of the number and amount of scholarships his students have received. He said since 2004, students have earned a total of $993,000 in scholarship funding. Mitchell said he has been accepted at the University of Dayton and the University of Cincinnati, but hasn’t made up his mind which one he wants to attend. Mitchell said he doesn’t have any particular theme in mind for his wall piece. He said he is considering different ideas, but just hasn’t settled on one idea yet. Chaney told Mitchell that after spring break they start painting. Tori Warnock, a junior, will have to wait until next year to leave her mark on the walls of Buckeye Valley. She said she walks the halls looking at what others have painted to get some idea of what she might paint. “I like painting landscapes and portraits,” she said. Warnock said she still has some time to figure it all out. Warnock said she wasn’t going to go to school for art. This entry was tagged Buckeye Valley, Chaney, Scholarships. Bookmark the permalink.